We offer an all-inclusive Yacht Party experience. Ideal for any group looking for the ultimate party experience at sea select from our fleet of Yachts & Boats ranging in size from 30ft to over 100ft in length. 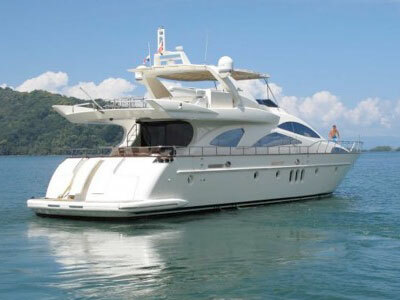 In addition to hourly, daily and weekly yacht rentals you always have the benefit of addicting the sweet amenities which make all the difference. Enjoy the company of a professional Masseuse on board kneading out your cramps after a day of fishing or lounging in the sun. We provide roundtrip transfer transfers for large & small groups up to 20 persons between any location and to your yacht of choice. Catering packages start at $35pp for prepared food and snacks. Open Bar packages are ideal for any day at sea with all you can drink options available onboard. Bring a little excitement to the sea with a DJ on board spinning high powered tunes enough to get any party moving. You may have seen television commercials for some off-shore location that promises clear blue waters and the time of your life aboard some overly fancy vessel. Sure, at the time something like that seems so far out of reach that it almost seems cruel that these advertisements tease in such a way. All hope is not lost, though, especially with the nearby location of Panama in your grasp. Surrounded by the clearest water you'll ever find, Panama offers the perfect opportunity for one to just sail off into the distance. 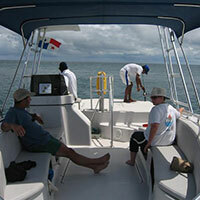 While you may not have your own boat to charter, finding one should be absolutely no problem. During your stay in this Central American local, you'll want to partake in the many affordable options that come with a yacht charter. Aside from offering you the option of sailing to an assortment of nearby islands or through the infamous canal, these yacht charters make you feel like the captain, and in the eyes of all the friends or family accompanying you, you'll be the top dog. Your choice of yacht comes in anything from a 26ft vessel to an astonishing 100ft behemoth that provides the ideal space for an on water party. On your gorgeous ship, you'll find yourself sitting comfortably in the cockpit as the fresh air whips around you. If you've ever wondered what it would be like to be at the helm of your own mighty vessel, than a yacht rental should definitely be on your radar. The yacht of your choice will come with a pristine interior, equipped to handle many occasions. An on-board wet bar and an audio system wired throughout the entire cabin will provide the entertainment for your trip and ensure that your guests are constantly entertained. Comfortable seating can be found throughout the yacht, both within the cabin and on top of the deck. Whether you decide to charter your vessel to the nearby islands or get a first hand look at Panama's historic canal, you'll be in for a treat not soon forgotten. Anchor your yacht in the midst of the crisp blue water and dive in to find out exactly what perfection feels like against your skin. The weather in Panama near guarantees a clear day, so you should have no problem in having to deal with rain or rough waters. For the ultimate private getaway, dock your boat at one of the nearby islands and set your party up on the gorgeous coastal line. On the calm waters surrounding Panama, there is little you'll have to worry about. Rent the vessel you're comfortable with and you'll be feeling like a captain in no time. Outside of your private cockpit, your fellow sea-goers will be far too engrossed in the perfect scenario they're in to even remember that their lives rest in your hands. Be sure to bring a camera; you never know what you'll see on your own private journey.